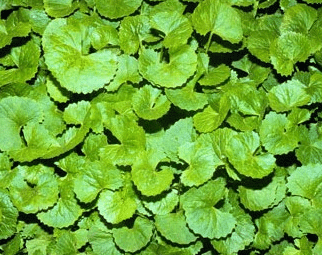 Gotu Kola (Centella Asiatica) is my herb of the week this week; while it is an herb you may not be familiar with, you will surely fall in love with it like I have. Gotu Kola has been used for centuries in both Chinese and Ayurvedic medicine. It provides not only a positive impact on many internal health conditions, such as stomach ulcers, fever, and asthma; it also offers multiple benefits to the skin. Because of Gotu Kola's many skin care applications, you'll see it included in many of our products. Gotu Kola is rich in triterpenoids — these organic compounds can boost antioxidants and are overall great for the skin. All of these wonderful qualities have made it an excellent natural and organic herb for oily skin and to help minimize the appearance of wrinkles and fine lines. Some of my favorite qualities of Gotu Kola are that it is cleansing. It is also an adaptogen. Because of all of these wonderful properties, I've added Gotu Kola to my anti-aging eye cream, herbal facial oil, anti-aging facial oil, anti-aging serum and coconut body oil. I know that this herb can help calm and soothe your skin. Give these products a try and see what they are able to do for you!